It displays a timecode of the playing movie in "h:m:s:f" format. You can seek the movie by pressing "Go" button. Datecodes (recording date and time) are automatically extracted from DV-captured AVI files, and displayed on the main panel. Note that many video editing software remove datecode information from DV-captured AVI files. This case, datecodes can not be extracted from the movie files. You can choose a playback size of the playing movie. Playback size includes Fullscreen / Fixed size. Snapshot: It opens the snapshot panel. Thumbnails: It opens the thumbnail view. Effect: It opens the special effect panel. Info: It opens the information panel. Settings: It opens the setting panel. These buttons become active when Pause button is pressed. When "Repeat-loop" checkbox is marked and "Play/FastForward/Slow" button is pressed, the selected portion of the playing movie will be repeatedly played back. A selection collapses when both a selection start and selection end are set to be identical. Mouse wheel and Page Up/Down buttons change volume of the playing movie. A filename of JPEG/BMP/PNG file to be created as a snapshot image file. Extensions such as .jpg and .bmp can be omitted. You can get one shapshot image from the playing movie by pressing this button. This button becomes active when "Pause(Stop)" button is pressed. The size of the generated snapshot images is identical with the size of the movie viewing window. When a selection is set, every frame of the selected portion can be converted to JPEG/PNG/BMP images. 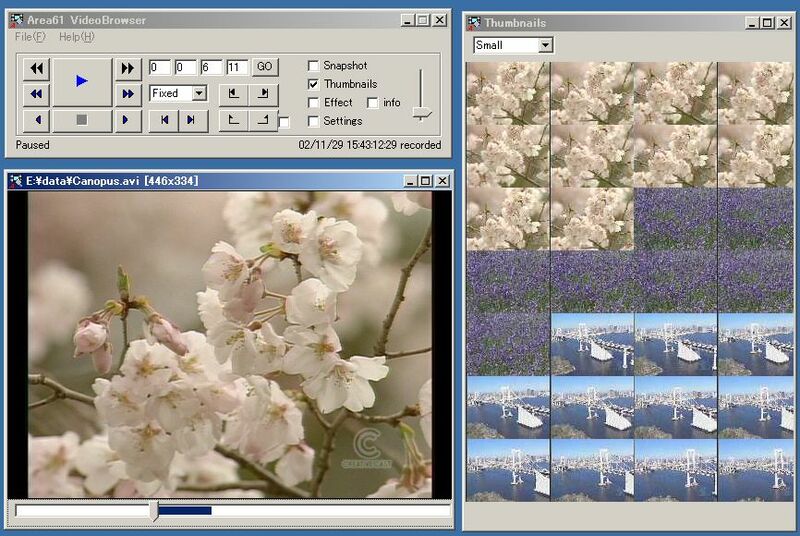 You can select a snapshot image format from JPEG/BMP/PNG. If JPEG is selected, a slider bar that can be used to change quality of JPEG image appears. If "Auto numbering" checkbox is marked, a sequential number is added to the filename of the generated image file. It changes quality of JPEG image to be created. Default value is 75. It changes brightness of snapshot images to be created. Default value is 0. If this checkbox is marked, noninterlaced snapshot image is created from the playing movie. This function is especially effective on DV-captured AVI file. When you select VMR9 and your graphic card supports necessary features, a brightness control slider bar appears. VMR/VMR9 usually with deinterlace movie files. If this checkbox is marked, "GPL MPEG-1/2 Decoder (FREEWARE)" is used in preference to other MPEG2 codecs installed in your PC. GPL MPEG-1/2 Decoder is recommended because many other MPEG2 codecs don't allow software to create snapshot images. It shows the current position of the playing movie. You can seek the movie by click on the slider bar.